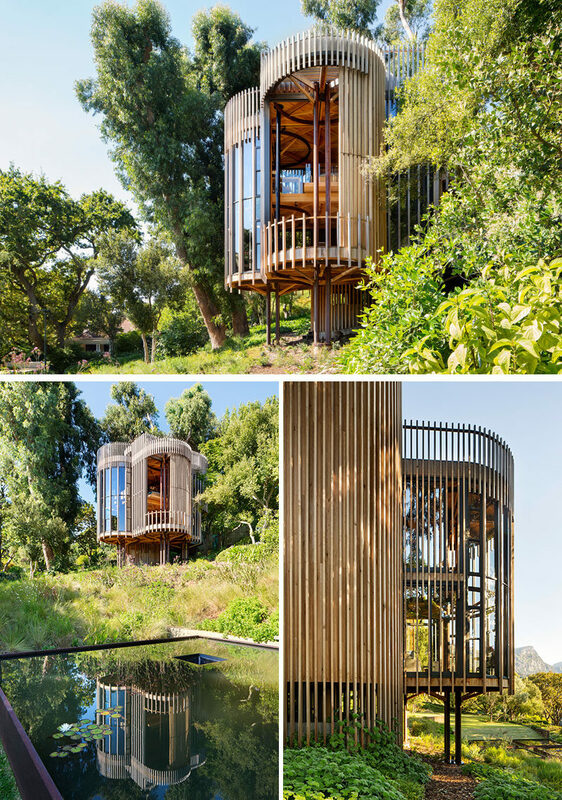 Architecture and interior design firm Malan Vorster, have designed the House Paarman Tree House in Cape Town, South Africa. 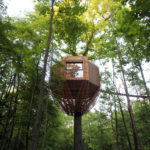 The small one bedroom home in the trees was built from materials that when left untreated, would allow the materials to weather naturally with the surrounding forest. 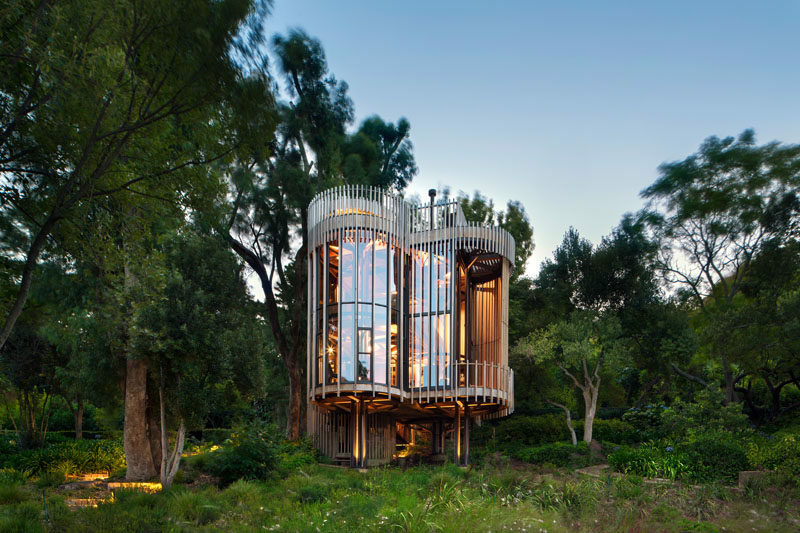 The house is located in a clearing of the forest, on a bit of a hill, providing spectacular elevated views. The home makes use of vertical height, and has been arranged around the geometry of a square with four surrounding circles, creating a pin-wheel plan layout. 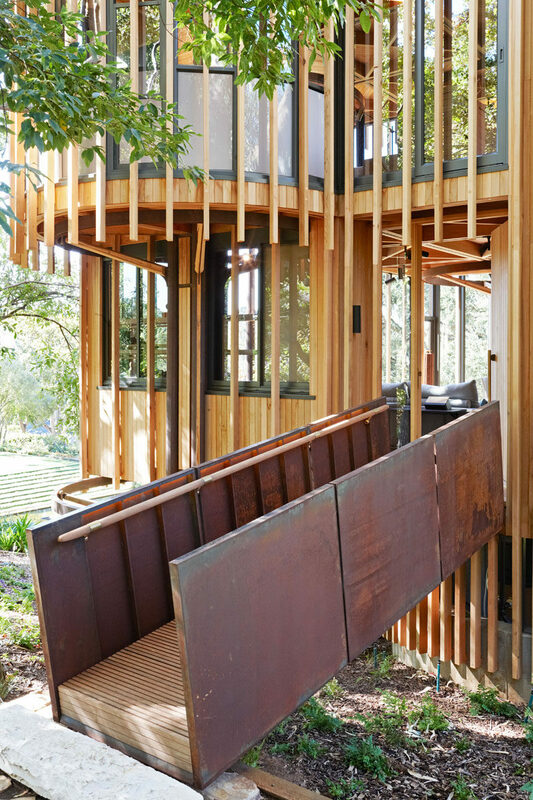 A raised timber and weathered steel ramp leads to the front entrance of the home, and into the first level of the house. The first floor is home to the living room that opens up to a balcony. Decorated in light greys and earth tones, the room compliments it’s wood surroundings. 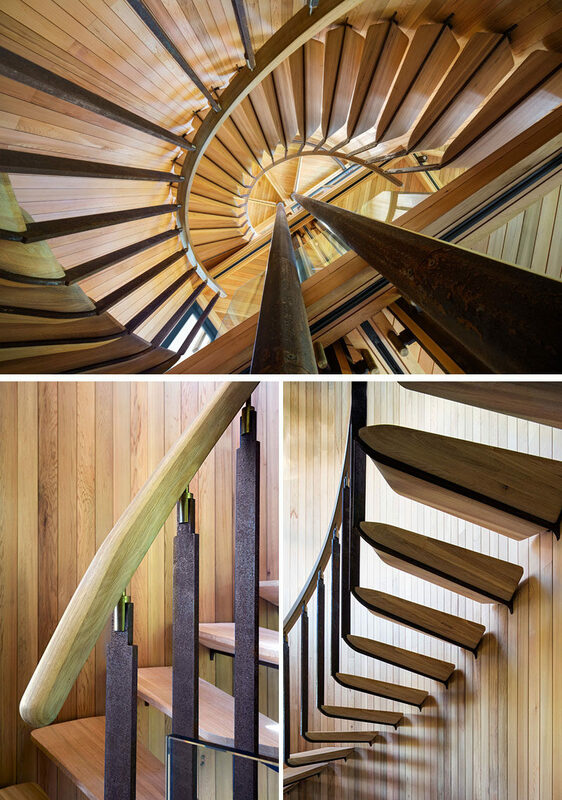 A spiral staircase with a wood handrail and steps wraps around steel support beams, and leads to the upper levels of the house. Upstairs in the bedroom, a glass safety railing has been added in front of the bed to provide an unobstructed view of the trees. On the same floor as the bedroom is the bathroom. Paneled black framed windows compliment the dark tiled floor, while a white circular sink with a brass faucet rests above the light wood vanity. 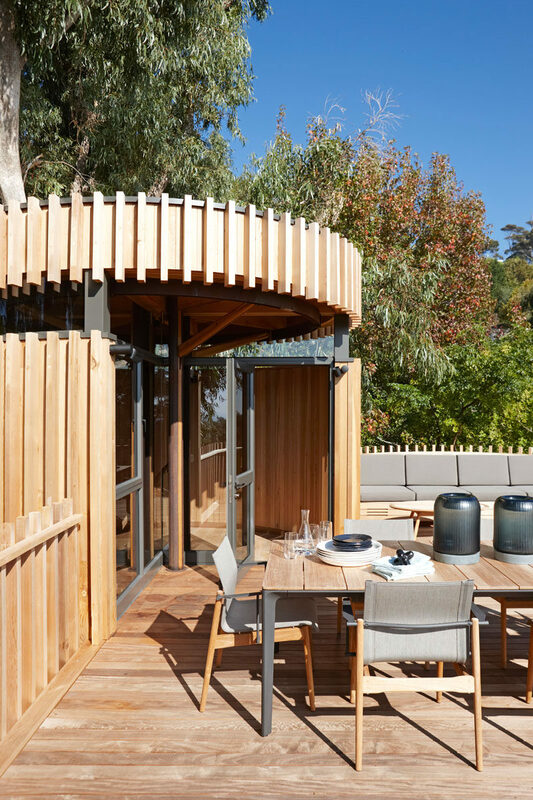 On the roof of the home there’s a deck with a dining table and built-in seating. Being on the roof of the home makes it feel like you are dining in, and with the tops of the trees. 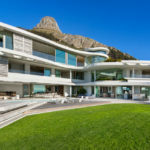 Throughout the home you are able to see geometric structures that reveal how squares and circles have been used in harmony for the architectural plan of the house. 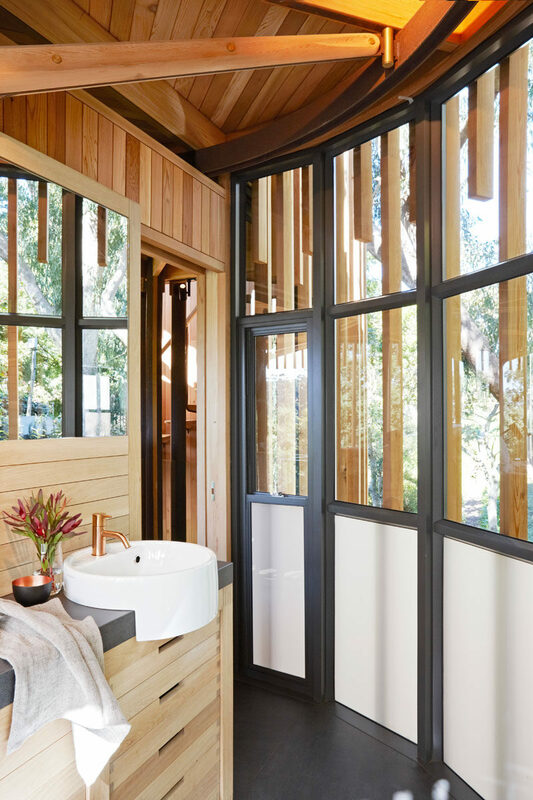 Here’s a close-up look at some of the details, like the steel and wood, branch-like arms that connect and support the beams and columns of the home.